Owls, Nike and Hawker Stalls. It was a busy April for Melissa and I as we had some unexpected travel opportunities pop up. We spent one weekend in New Delhi, Agra, and Jaipur with our friends Anil and Bhavana. We hit up Delhi for shopping, eating and taking in the city. We stayed in a neighborhood that was cleaner and more orderly than Bangalore, but still crazy compared to anywhere else you would find. We took a train from Delhi to Agra to see the Taj Mahal. We had tickets for the evening tour of the Taj Mahal. Night tours happen once per month, two days before and two days after the full moon. I had visions of the full moon in the back round whilst admiring the glowing Taj Mahal. Well, it played out a bit differently than that…the moon was behind us and nowhere to be seen and we about 400 yards away from the building. Needless to say, it was a bit of a disappointment. But on the bright side, it was extremely peaceful they only let 50 people in at a time for evening viewing. We’re already scheming plans to go back during the day so we have photographic evidence we were there. When people ask us how the night tour was, we show them our blank phone screens and tell them that it’s a pic us at the Taj. (Kind of like showing a bare fist and telling people that you are showing off all of your Vikings Super Bowl rings). While leaving the Taj grounds, in a bus with open windows, a baby owl flew into the moving vehicle and landed on Melissa’s shoulder. You can’t make this up. She was slightly embarrassed for screaming so loudly and creating a bit of chaos, but I’m not sure how one should react in a situation like that. We were told later that it is extremely good luck if an owl lands on you, but they also said the same thing when a pigeon relieved itself on the back of Melissa’s neck in Mumbai so we’re not sure we buy it. Following Agra, we took another train to Jaipur, the “Pink City” as it is referred to. It was painted pink to welcome the Prince of Wales in 1876 and has remained that way to this day. We toured City Palace and Jantar Mantar. 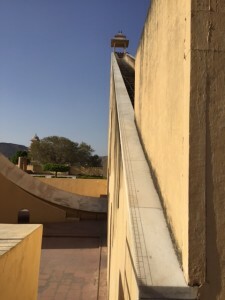 Jantar Mantar, which means “calculating instrument” in Sanskrit is a series of instruments built in 1734 to measure time, day, month, earth positioning by using the position of the sun. It is also home to the largest sundial in the world. It was very impressive to see something built so long ago and you could literally tell the time of day to the second. After a few days back in the office, we had to dig out our sweaters, get packed and head to Paris to see my mom! This too was an unexpected trip. She was in Luxemburg with family and wanted to see Paris so we decided to meet her for along weekend. Words cannot describe how great it was to see her! It was worth the long flight taking in such an iconic city with her. We took in most of the tourist spots. 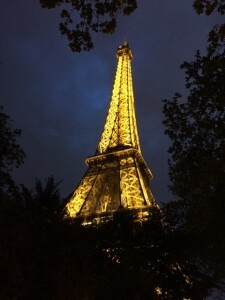 We did a night tour of the Eiffel Tower, which we would highly recommend unlike the Taj evening tour. We also did the Rodin Museum where the “The Thinker” statue is housed. We took in the Panthéon were Victor Hugo rests. Saw some Monet and van Gogh at the Muse d’Orsay. We were also able to see some of the Easter Sunday Mass at Notre-Dame. We shopped our way to the Arc de Triomphe. 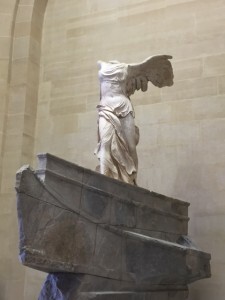 We said “hi” to Mona Lisa at the Louvre, but for me the “Winged Victory of Samothrace” or “Nike of Samothrace” stole the show. Not sure what it is about the sculpture, but next to “David” it is my favorite piece of art I have seen in person. It was sculpted around 200 BC in Greece to celebrate a Naval victory. I can see why Phil Knight named his iconic company after it. We put on a lot of miles in Paris (averaging 10/day). We popped in and out of shops and refueled on croissants, cheese, and champagne. We had the best oysters and best French Onion soup I have ever eaten, naturally there was no shortage of bread, so much bread! Bruce Lee kicking a cat. 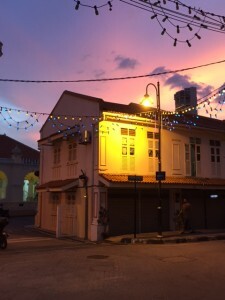 This last weekend we went to the city of Georgetown in Penang, Malaysia. There is a large portion of the city deemed an UNESCO World Heritage site. 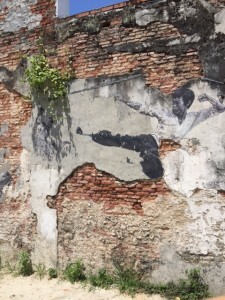 It has fantastic architecture, old Chinese clan houses, mansions and world famous street art. It is also regarded as having some of the best food in Asia. It can get a little overwhelming with all the hawker stalls but well worth it. Hawker stalls are basically street food vendors; they are concentrated in one open-air building. You can order different foods from different vendors and they will deliver to your table and you pay as you go. Many of the TV food shows have been to Penang for this very reason. Like Paris, we walked a lot every day only this time in hot and humid conditions. We had to stay alert for all the random street art around every turn. Penang wrapped up a crazy travel month for us, we will be staying put for a few weeks as we gear up to meet friends in Greece!